Rare, late 19th century French Limoges China Art Porcelain hand painted fish set, painted with sky blue & light brown colors with ornamented gilt foliate edges to each porcelain dish, each dish depicting a swimming carp with-in fresh waters along applied sea weed motif with heavy raised gold leaf decoration. The set includes twelve plates, sauce boat, sauce under plate and main oval shape dish. Espert, comes with original box with red silk cloth. The porcelain set is in near excellent condition, with minimal gold leaf wear. The original wooden case shows some damage, scratches, wear and tear to the interior. 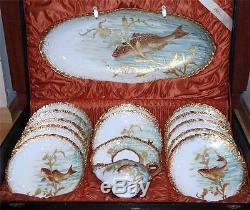 During our 15 years in business this is first such High Quality Limoges Fish Set w/Raised Gold Leaf Decor. Marked: Limoges France, China Art Each plate 9 ¼ in. In diameter Under sauce plate 9 in. Sauce boat 8 ¼ in. Main dish 24 ½ in. Width, 2 ¼ in height Wooden box 29 in. Please note: price set with-in reasonable range based on condition of the article. Better Prices On-Line Store At rubylane/shop/gaiaantique. FOR BETTER PRICES, Lower Prices. This is a store policy -- NO Negotiation. We will leave a feedback after customer's initial input. The item "Antique Rare French Limoges Hand Painted Raised Gold Porcelain Fish Set withBox" is in sale since Sunday, December 7, 2014. This item is in the category "Antiques\Decorative Arts\Ceramics & Porcelain\Plates & Chargers".